Barbecued Salmon with Herb Mayonnaise recipe is so easy and simple to make. Coating salmon with a mixture of mayonnaise and herbs results in an unbelievably moist, buttery fish with all kinds of good flavors. The mayonnaise keeps the salmon moist while barbecuing. 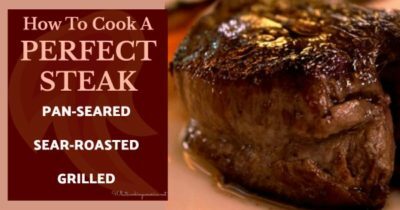 I know that you will definitely be making this recipe again and again. The Barbecue Salmon with Herb Mayonnaise is my stand-by for a quick and delicious elegant salmon dish. For an extra special treat, try making your own homemade blender mayonnaise. Your are probably saying – Why should I make my own mayonnaise. There are two (2) main reasons for making your own mayonnaise – freshness and flavor. Homemade mayonnaise is fast and easy to make in a blender or food processor. It takes less than 5 minutes to make. More of Linda’s great Salmon Recipes and also How To Select, Buy, and Cook Fish. Please check out my dinner party menus which includes this wonderful and easy-to-make Barbecued Salmon with Herb Mayonnaise. Preheat barbecue grill. Wash salmon filet and pat dry. Place salmon (skin side down) onto a large piece of aluminum foil. 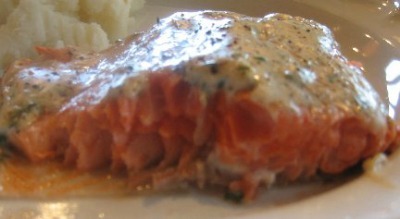 In a small bowl, with a wire whisk, combine mayonnaise, lime juice, and herbs until smooth; spread over top of salmon. Sprinkle lightly with salt and pepper. Place salmon (with aluminum foil) onto hot grill of your barbecue. Cover barbecue with lid, open any vents, and cook 8 to 12 minutes or until a meat thermometer registers an internal temperature of 145 degrees F. (salmon will be slightly opaque in thickest part). During this time the salmon continues to cook (meat temperature will rise 5 to 10 degrees after it is removed from the grill) and the juices redistribute. Carefully remove salmon from grill and transfer onto serving platter and serve.